“Send To” right click menu contextual item is one useful feature in Windows operating system that allows user to easily send (or copy) files or folders to another destination or program for processing. Typically, the out-of-the-box default Send-To menu items include Compressed (zipped) Folder, Desktop (create shortcut), Documents, Mail Recipient, Fax Recipient, CD/DVD RW Drive and etc. For user who wants to copy the files or folders to other target directories, such as various user-specific folders including Downloads, My Documents, My Music, My Pictures, My Videos, Saved Games and etc., he or she will need manually add in such folder destinations into “Send To” folder (in Windows Vista or Windows 7, it’s located at C:\Users\[user name]\AppData\Roaming\Microsoft\Windows\SendTo folder) to use as right click menu shortcut, or manually copy and paste to the particular directory. In Windows 7, user no longer needs to go through such as hassle to add or install these frequently used user folders into “Send To” menu. 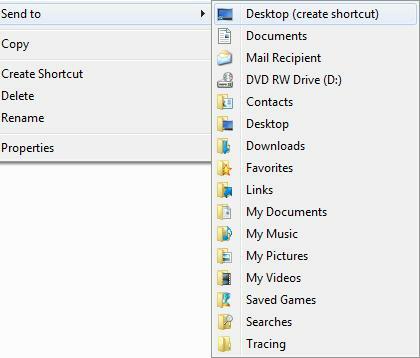 Windows 7 contains a hidden expanding “Send To” menu, which can be activated easily by pressing and holding “Shift” key when right clicking on selected files or folders. Press and hold “Shift” key when right clicking has been implemented by Microsoft since Windows Vista and Windows 7 in order to reveal additional hidden contextual menu commands such as Open Command Window Here, Copy as Path, Open in New Process and to reveal typical right click context menu for icons pinned to Taskbar. “Send To” menu is actually one of the item listed on the right click menu. By holding down the “Shift” before right clicking, not only is the right click contextual menu itself is expanded with several hidden commands, the “Send To” sub-menu will add few more directories and folders which belongs to the logged on user too. The expanded “Send To” submenu now contains all logged in user folders such as Contacts, Desktop, Downloads, Favorites, Links, My Documents, My Music, My Pictures, My Videos, Saved Games, Searches and Tracing.